Sunday my birthday, my husband’s birthday, and my brother in-law’s birthday were celebrated together with family. 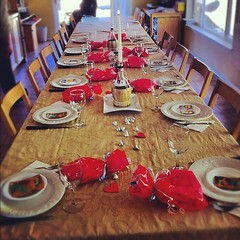 We had the most amazing meal that consisted of bacon-wrapper shrimp, BBQ steak, baked potatoes, Caesar salad, homemade rolls, red wine, followed by chocolate cake and cookies-and-cream ice cream for dessert. 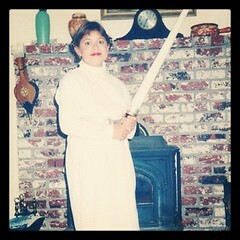 #FebPhotoADay Challenge Day 21 “A Favorite Photo of Myself” – My love for Star Wars began in second grade however it wasn’t until fourth grade that I dressed up as Princess Leia for Halloween. 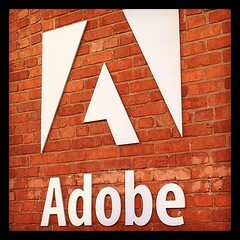 Today I went on a field trip with my fellow classmates from the Web Design & Interactive Media department to visit Adobe. Total geek out! Went home with some top-secret swag! 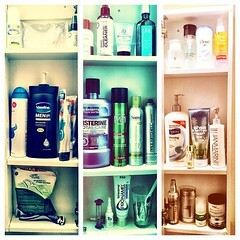 #FebPhotoADay Challenge Day 24 “Inside My Bathroom Cabinet” – Guests don’t get to take a peak in this cabinet as it’s located in our master bathroom. Joshua gets the far left side, but he also gets the entire cabinet in the guest bathroom. I get the middle and right side, but I also get the vanity, hehe.